There are many instances of spectators getting involved in the racing, the positive(ish) side of this is riders being cheered on as they’re inching their way up a gruelling mountainside or our glimpse of the Devil jumping at the roadside every year but every now and again someone gets it wrong. 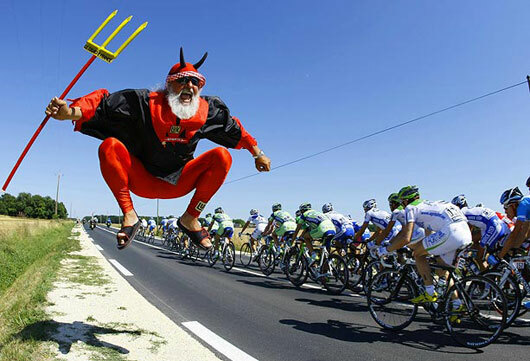 Possibly the most famous is Lance Armstrong vs The Bag in the 2003 Tour de France. This one was one of genuine accident rather than any blame on either the rider or the spectator, it just so happened that Armstrong managed to end up in the wrong place for once as his brake lever caught perfectly in the handles of a carrier bag. This tugged the handlebars and down he went along with Iban Mayo who was following. This event passed into legend when Armstrong caught up with a waiting Jan Ulrich and then launched his own attack, winning the stage (after catching a young Sylvain Chavanel) despite the fall. 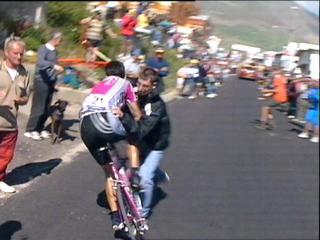 The one I always remember as a kid, was Giuseppe Guerini on the Alpe d’Huez in 1999. Guerini was on a solo attack having left Richard Virenque and Lance Armstrong behind (no mean feat) and was nearing the final part of the stage. A spectator decided they wanted a picture of this moment and popped out directly into Guerini’s path causing both to fall to the ground. This incident generally gets used as an example for what not to do as a cycling spectator and shows how we as regular people can affect the race, although luckily in this case, not the result. One from last year that sticks in my mind because I was at the race, is Zdenek Stybar in the 2013 Paris – Roubaix. Having got himself into the winning breakaway with Fabian Cancellara and Sepp Vanmarcke, Stybar was right in the mix for winning on his Roubaix début. On a key stretch of brutal pavé, the Carrefour de l’Arbre, with lots of spectators and with the riders switching between the left hand and right hand edges of the ‘road’, Stybar effectively took a shoulder check skewing him across the pavé and nearly into the crowd on the other side of the road. Surprisingly he didn’t go down, but in the time it took him to clip in and get back up to speed the other two riders were gone and so were chances of victory. In fairness to the spectator, this is a bit of an odd race. The riders all want to ride on the gritty flat bits at the side of the road rather than waste energy struggling in the middle which they are in every other race. Riders hunt out these bits of non-pave which in theory is where you have to stand as a spectator to watch them! 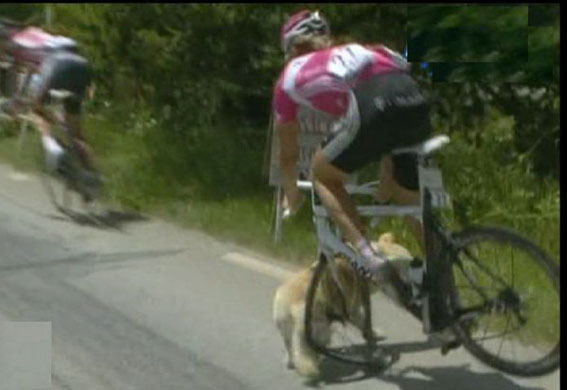 Finally, Marcus Burghardt managing to hit a dog in the 2007 Tour de France. It took place on one of the toughest stages from Val d’Isere to Briancon in the French Alps. The peloton went through an innocuous village and into a small split near the back wandered a labrador dog. One rider avoided it but Marcus Burghardt managed to hit the dog square on the flank, instantly snapping his front wheel in half as he goes over the handlebars onto the floor. The dog gets knocked off its feet and has the bike land on him but appears completely unhurt by the ordeal and potters off bemused before its owner spectator appears. Burghardt as well appears relatively unhurt, just a couple of scratches and with a new wheel gets on his way. I’ve hit a dog before now, admittedly at lower speeds and definitely not the smartest dog as it turned around back into my path – I’m just glad I didn’t have those wheels! There’s definitely a load more, there’s a famous one in a sprint finish with a police officer spectator knocking off Laurent Jalabert and others…let me know of any obvious ones! It’s frustrating to see inconsiderate spectators during pro bike racers. It’s definitely not ideal…I’d say the incidents are quite rare though thankfully considering how many people line up to watch races. The four I’ve posted are 15 years apart and I’m struggling to think of any major ones in between (though I’m sure there are some).